This week is a golden period for the jailbreak community. UnC0ver Jailbreak V 2.2.0 (Public Beta 5) was released for testing. @S0rryMyBad demoed an actual jailbreak for iOS 12-12.1.1 on an iPhone X and released the PoC for the jailbreak. Moreover, just yesterday, @tihmstar released the tfp0 exploit, which is extremely essential for a jailbreak, for iOS 11.4.x. Using the tfp0 treadm1ll exploit and various other bugs, after a long hiatus, Coolstar and Electra have come up with a new version of Electra Jailbreak V 1.2.1 available for all devices from iOS 11-11.4.1. The latest Electra release is probably the fastest jailbreak update yet. Though the UnC0ver Jailbreak is stated as much stable compared to the Electra Jailbreak; Electra has a loyal following and the users are now rejoicing over the quick update to iOS 11.4.x brought by Coolstar. What’s New in Electra Jailbreak V 1.2.1 IPA? Supports iOS 11.4 – 11.4.1. Added async_wake exploit to add support for iOS 11.0 – 11.1.2. Used voucher_swap exploit instead of empty_list for iOS 11.2 – 11.4.1. Added treadm1ll exploit as an option for iOS 11.2 – 11.4.1 users on A7 or A8 devices. Coolstar recommends deleting any iOS 12 OTA from the device prior to installing the new jailbreak tool. As per the various user reports pouring in the new Electra version has a massive over 90% jailbreak success rate which is huge. Please note that prior to Electra V 1.2.1, V 1.2.0 was released. Users on iOS 11.4.x were facing crashing issues with V 1.2.0 and Coolstar was quick to respond to the same. In Electra V 1.2.1 the crashing issue was fixed. How to Jailbreak Using Electra V 1.2.1 IPA? 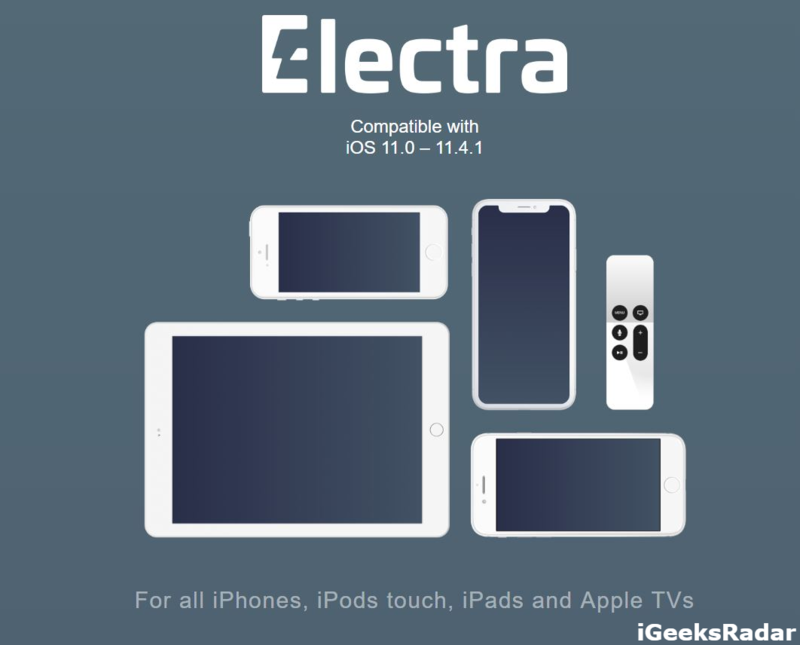 As a first, you require heading over to coolstar.org/electra in order to get started. You require sideloading the jailbreak app every 7 days with Cydia Impactor. Once you have sideloaded the application please turn off Siri and mail fetching, and turn on Airplane Mode. If you are using the VFS version you will need a couple of tries before you get into jailbroken mod. If you are using the MP version you will get into jailbroken mode in 1 or 2 tries max. Please note when the jailbreaking fails reboot your phone -> open the jailbreak app and wait at least a minute before pressing jailbreak again. You require re-jailbreaking every time you reboot or power off the device. If you ever require rebooting without going into jailed mode use the ldrestart command in terminal or take the help of various tweaks. So, that was all regarding Electra Jailbreak V 1.2.1 IPA for iOS 11.4-11.4.1. If you face any issues while jailbreaking do let us know about the same in the comments section provided below. Please let us know about your jailbreak experience as well. Critical Eavesdropping Spy Bug in FaceTime | Apple Taken Group FaceTime Offline.